Situated approximately 75 miles east of Redding California, the Fall River Valley is surrounded by Lassen, Shasta-Trinity and Modoc National Forests, Lassen Volcanic National Park, McArthur-Burney Falls Memorial and Ahjumawi Lava Springs State Parks and various Wildlife Refuges to the northwest. From its snow-capped heights, the majestic Mt. Shasta and Mt. Lassen tower over the region. Wild rice isn't literally a rice at all. It's the seed of Zizania palustris, a tall, blooming water grass that prospers in shallow lakes, marshes and streams, the only cereal grain native to the North American continent. It grows naturally in the Great Lakes region of Minnesota, but a California farmer in the early 80’s thought it would do well in the Fall River area. And he was right. Fertile soils, lush forests, clean air, spring waters, and a crisp climate make this an ideal mountain valley for producing wild rice. Another interest of Walt’s is nutrition. Highly nutritious, wild rice contains more than 12% protein uncooked, significantly more than common white rice or most other grains. It is high in complex carbohydrates and is a good source of fiber. In contrast, its sodium content is refreshingly low. 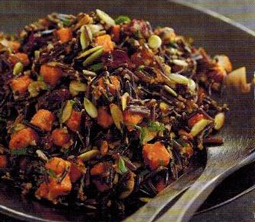 Wild rice is easy to prepare; the longer it cooks, the softer and fluffier the grains become. 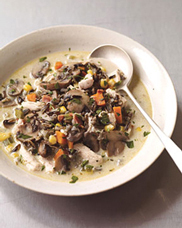 Simmering in broth or wine gives wild rice a rich, full-bodied taste, and its flavor can be further enhanced by adding chopped vegetables, nuts or fruit. Uncooked wild rice will keep almost indefinitely, when stored in an airtight container. Cooked, it will keep for 10-14 days refrigerated, or can be frozen up to 6 months.